Dangly earrings, pretty necklaces, chic rings, and delicate bracelets... I love them all, but I hate how messy and tangled they get in my drawer! 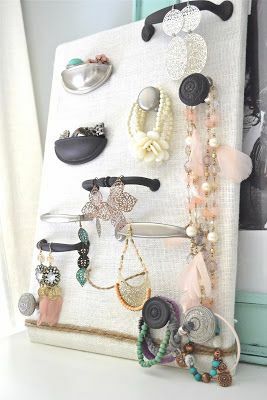 I'm obviously in need of a jewelry organizer, but I haven't been able to find the perfect idea... until now! These DIY projects look like so much fun to make, and they're definitely pretty to look at. I'm so much more likely to wear my jewelry if it's out where I can see it, and I bet you are too! I'm not sure which part of this I love more: the clever shoe racks, or the way all the jewelry is so neatly displayed! I think I would definitely love cleaning my closet if I had this hanging on the closet door. 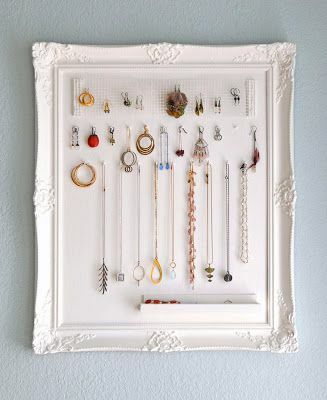 Peg boards are so much fun, but I never thought of using one to organize my jewelry! The best part? You can reconfigure the design every time you buy something new or get rid of an old piece you don't like anymore! 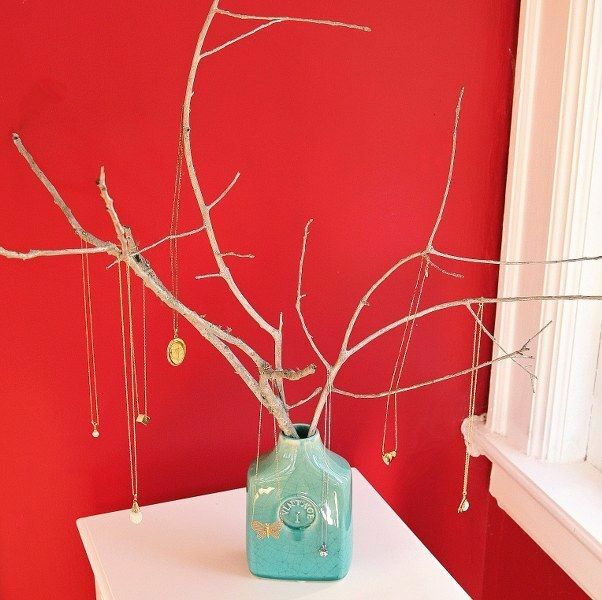 This whimsical jewelry tree reminds me of an Easter egg display, but I would want to keep it up year-round! You could probably make one for yourself without spending even a single penny. 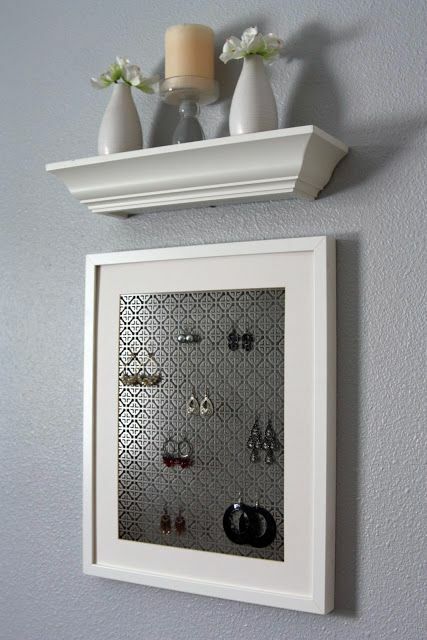 This project is only really useful for holding earrings, but it's such a great way to display them! I never thought that a piece of radiator grate could be so pretty, but this practically doubles as a piece of wall art. 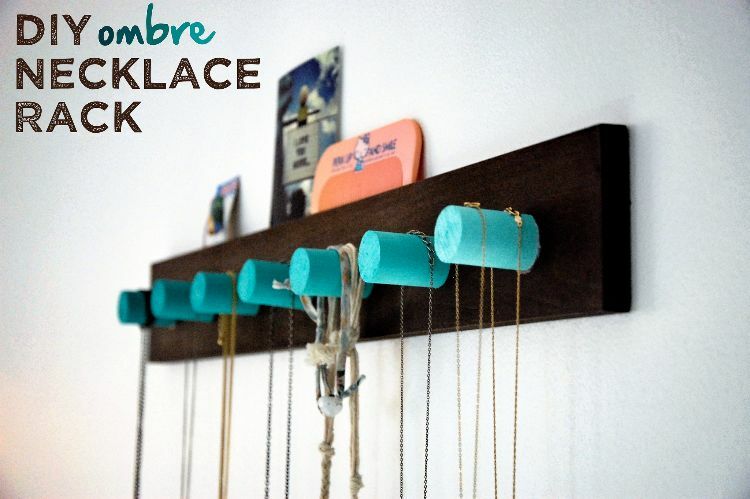 I always love a good ombre DIY, and this necklace rack is no exception! It's definitely cute on its own, but I think I would want to incorporate it into a larger jewelry display that had space for my earrings and rings as well. 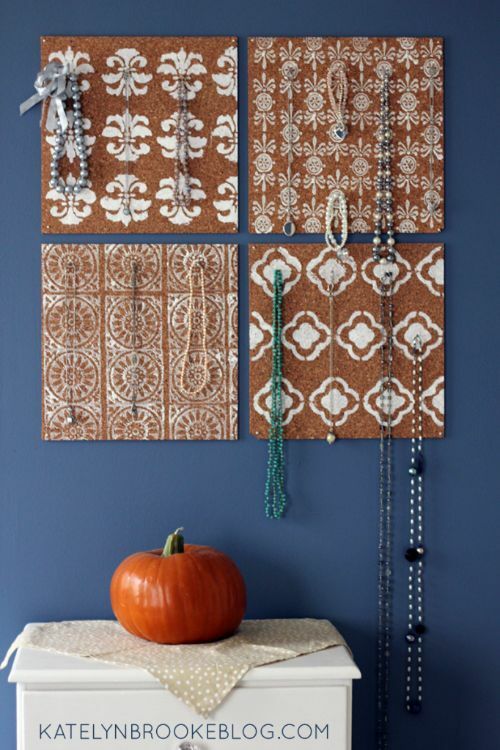 If you want to make a statement without spending too much money, this stamped cork jewelry board is perfect! You could definitely fit more jewelry onto this than shown below, but I think the minimal look makes for a nicer wall display. Forget about your spoons, knives, and forks – use a cutlery tray to store your jewelry instead! All you need is some pretty paper and a few elegant dresser knobs, and you can make a jewelry holder just like this one. 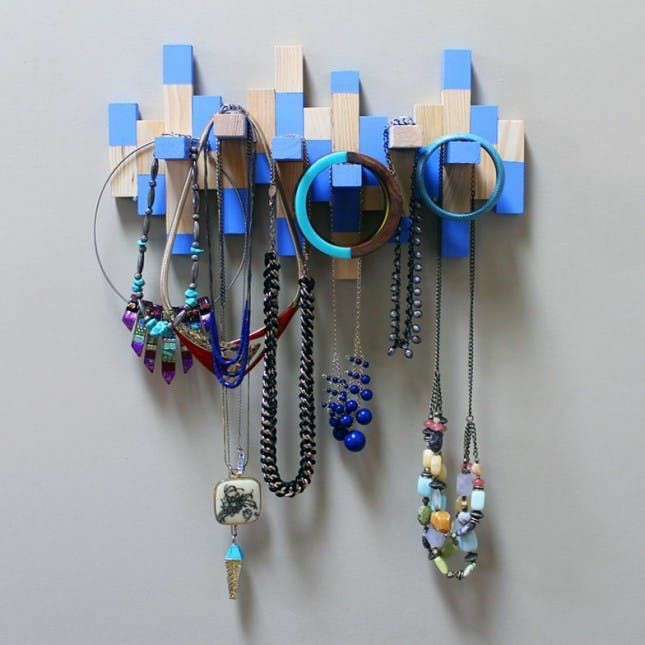 Embrace your inner child with this fun necklace holder made from an old Jenga set! Don't be shy when it comes to choosing a color – the bright blue color used here makes the piece even more fun than it would be otherwise. 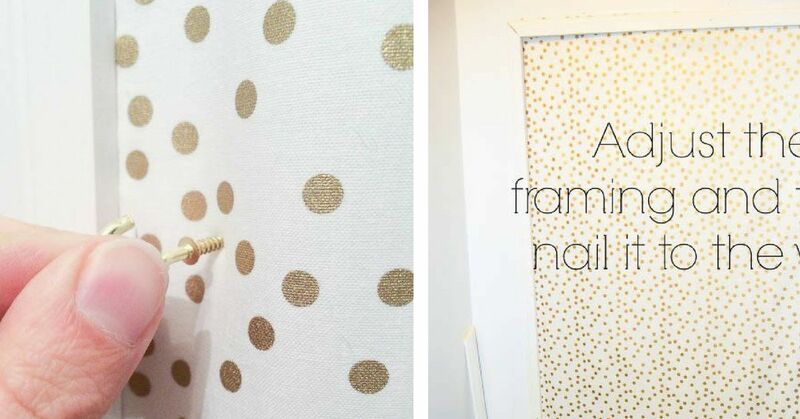 If you want to turn your jewelry display into a piece of wall art, all you need is a cute frame! I love how you can see every piece perfectly against the cream-colored background. 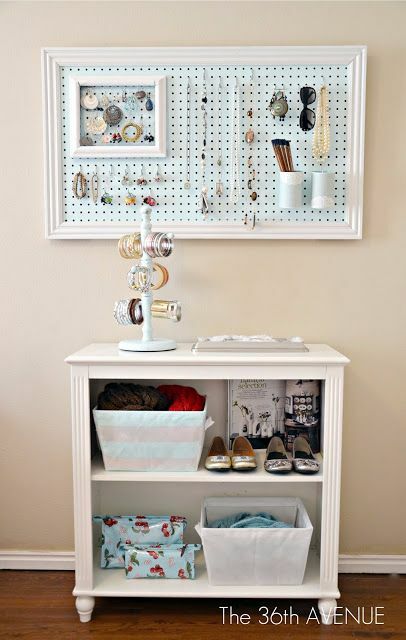 If you have any mismatched pieces of dresser hardware lying around, this is the perfect way to put them to good use! This jewelry holder could work for almost every type of jewelry out there, and it would be such a fun and unexpected piece of decor for your bedroom. 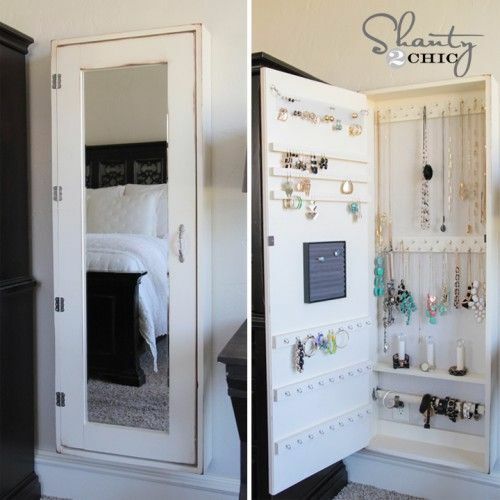 This jewelry cabinet is absolutely perfect for anyone who has a big jewelry collection! It has so much space, and I love that it has a mirror on the front so you can check your reflection before making a final decision! 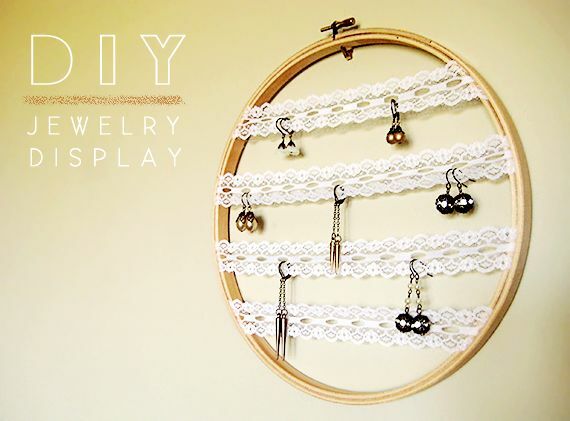 This lacy earring holder is so sweet – it kind of reminds me of a dream catcher! I love the classic white lace, but it would be fun to make a version with colorful lace as well. Did these jewelry holders inspire you as much as they inspired me? Spread the inspiration around by sharing this article with your friends and family on Facebook!